Today's Prompt: Dr. Seuss Day! Write a post with as many rhymes as you can. Oh boy, oh boy, what to say? How many rhymes can I make today? I'm counting on him to show the way. Written by him, but let's take a look. Or crazy concoctions that need a cook. But this does not explain who I am. 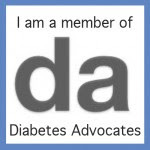 I have diabetes, it does not have me. Come step in my shoes and you will see. But I know I can count on the DOC! OMG I LOVE THIS!!!!! i love rhymes yes i do, i love rhymes, how 'bout YOU?? ?